Paleobotanists divide Phanerozoic time into three eras: the Paleophytic, Mesophytic, and Cenophytic (Traverse 1988b). The Mesophytic-Cenophytic boundary lies nowhere near the Mesozoic-Cenozoic boundary. Because it is defined by the first appearance of the angiosperms, the Cenophytic begins in the earliest stages of the Cretaceous, some 60-70 million years before the K-T boundary. Angiosperm evolution was rapid in the Cretaceous and global summaries based on megafloral and palynofloral data (Crane and Lidgard 1989, Lidgard and Crane 1990, Drinnan and Crane 1990) show an equatorial origin in the Barremian followed by an explosive race to polar latitudes by the Cenomanian. Nearly all Cenomanian and post-Cenomanian megafloras are dominated by angiosperms. In terms of temperature, Wolfe and Upchurch (1987b) using leaf margin analysis documented a gentle warming from the Albian to the Santonian, followed by a gradual cooling to the early Maastrichtian, culminating with a rapid late Maastrichtian warming. Huber et al. (1995) used isotopic analysis of marine foraminifera to generate a Late Cretaceous temperature curve with similar trends but with no obvious latest Maastrichtian warming. Subsequent more detailed analysis of magnetostrati-graphically calibrated marine and terrestrial records shows warming occurred within the last 500 000 years of the Cretaceous both in deep-sea cores and in terrestrial deposits (Wilf et al. 2003). The latest pre-angiosperm Mesophytic Era (Early Cretaceous, Berriasian-Barremian) is characterized by the Wealden flora of southern England (and correlative floras in France, Belgium, Germany, Spain, and Portugal). The English portion of this flora, summarized by Watson and Alvin (1996), is composed of 4 bryophytes, 4 equisetaleans, 3 lycopods, 10 families of pterido-phytes representing about 16 species, 1 Caytonia, 1 pteridosperm, 12 cycads, at least 23 bennettitaleans (foliage types only), 2 ginkgophytes, 2 czekanowskialeans, and 5 families of conifers represented by about 20 species. There are two possible angiosperm species in this flora. By the Cenomanian, floras were dominated by angiosperms (e.g., the Dakota flora of Nebraska and Kansas). The transition from Mesophytic to Cenophytic floras is thus a relatively rapid one with the classic elements of the Mesophyticum (Krassilov 1987) succumbing to the angiosperms in terms of taxonomic diversity by the beginning of the Late Cretaceous, then with respect to vegetational cover during the Late Cretaceous (Wing and Boucher 1998). Over the course of the Late Cretaceous, many groups of non-angiosperms became relatively less important or extinct as the angiosperms became more diverse. Bennettitaleans disappeared entirely from the record by the Santonian. Other Mesophytic holdovers that survived into Campanian-Maastrichtian time include Ginkgo, cheirolepidiaceous conifers, and archaic cycads like Ctenis. Simple-leafed cycads like Nilssonia became increasingly less common through the Late Cretaceous, essentially disappearing in the Maastrichtian with only a few isolated occurrences in putative Paleocene and Eocene deposits of Washington State and Russia. 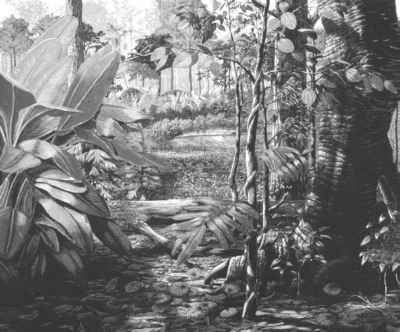 Ferns and compound-leafed cycads continued to evolve and new forms appeared throughout the greenhouse world of the Late Cretaceous and Paleogene. Palms first appeared in the Turonian and, by the Campanian, many floras were vegetatively co-dominated by angiosperms, conifers, and ferns but taxonomically dominated by angiosperms. Thus, just before the K-T boundary event, world floras were conspicuously Cenophytic, that is to say angiosperm-dominated, in essentially all aspects. In order to focus our survey, we will turn our attention to the flora of the Maastrichtian, the final stage of the Cretaceous. This stage represents the last 5.1 million years of the Cretaceous and is a sufficiently long span to assess floral change before and at the K-T boundary. 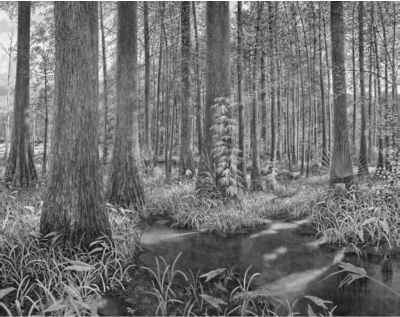 Figures 5.1 and 5.2 are artists' reconstructions of Maastrichtian vegetation based on paleobotanical data. Figure 5.1 Artist's reconstruction of Maastrichtian vegetation based on paleobota-nical data from the Laramie Formation at Marshall Mesa near Boulder, Colorado. Painting by Jan Vriesen. Reprinted couresy of the Denver Office of Cultural Affairs (DOCA). Figure 5.2 Artist's reconstruction of Maastrichtian vegetation based on paleobota-nical data from the Denver Formation near Strasburg, Colorado. Painting by Gary Staab. Copyright Denver Museum of Nature and Science (DMNS); reprinted by permission. Figure 5.3 Fossil pollen representative of the AquilapoUenites and Normapolles palynofloristic provinces. a - AquilapoUenites quadrilobus, b - Wodehouseia spinata, c - Extratriporopollenites sp. (atypical species of Normapolles pollen). Specimens range from 30 to 50 micrometers in greatest dimension. (primarily seed floras); in central India (primarily wood floras); and in the southernmost Andes of Chile and central Chubut Province in Argentina. Because of the microscopic nature of the fossils, palynological data are known from more regions, but it is notable that there is little known of either palynoflora or megaflora for the Maastrichtian of Australia, Africa, most of South America, and most of Eurasia. From this point of view, one of the most limiting aspects of the study of plants and the K-T boundary is the sparse global coverage of latest Cretaceous floras. For this reason, global summaries have been relatively broad-brush and have drawn large regional patterns based on modest data collected at the stage level. The quality of the primary data and its stratigraphic precision are quite variable and the geographic coverage is uneven, with large gaps in the areas mentioned above outside of North America. The two primary approaches have been the delineation of paleofloristic provinces based on palynology and the reconstruction of ancient biomes based on a combination of palynology and megafloral paleobotany. The earliest research on the definition of Late Cretaceous paleofloristic provinces based on palynology was conducted in Russia. Chlonova (1962) called attention to the existence of two groups of fossil pollen having unique morphologies that are present in northeastern Asia; they are present in western North America, as well. One group, which she designated the "unica" morphological type, includes Aquilapollenites (Figure 5.3a) and related genera (Fibulapollis, Orbiculapollis, and others) that are more commonly referred to as the Triprojectacites group or just as triprojectate pollen. Species of this group are characterized by unusual (Chlonova said "peculiar") apertures and a tendency toward asymmetric development of the poles. The other group, which Chlonova (1962) designated the "oculata" type, includes the fossil pollen genus Wodehouseia (Figure 5.3b). The unifying feature of this group is the occurrence of apertures in pairs close to the ends of the elongate grains. Chlonova noted that pollen of these two groups is present in Upper Cretaceous deposits of Asia from the Ural Mountains to the Far East and in western North America. Palynostratigraphic investigations conducted over more than 40 years on both continents have borne this out. The presence of large numbers of the morphologically distinctive fossil pollen of Aquilapollenites and Wodehouseia serve to characterize a palynofloristic province of Late Cretaceous age in eastern Asia and western North America commonly known as the Aquilapollenites Province. The Aquilapollenites Province disappeared as a paleofloristic entity at the end of the Maastrichtian, at least in western North America. Coeval with the Aquilapollenites Province but occupying eastern North America, Europe, and western Asia was the Normapolles Province, which persisted from Late Cretaceous into Paleogene time. 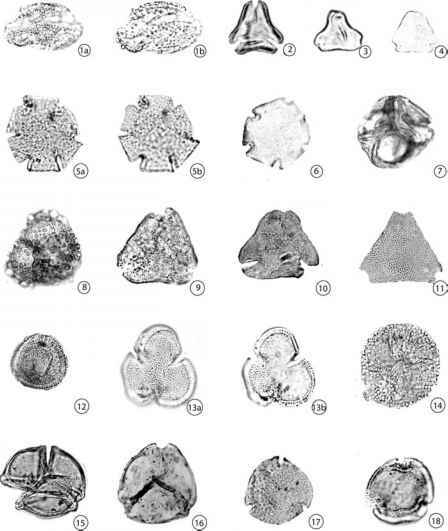 The characteristic angiosperm pollen species of the Normapolles Province are triporate types, most with elaborately structured apertures (Figure 5.3c). Whereas the characteristic genera of the Aquilapollenites Province such as Aquilapollenites and Wodehouseia represent extinct groups of plants of uncertain botanical affinity (most having became extinct at the K-T boundary), the Normapolles group of fossil pollen evidently represents plants that were ancestral to living families such as the Betulaceae and perhaps others whose pollen is characterized by three protruding pores. Batten (1984) presented a comprehensive review of the origins of paleoflor-istic and palynofloristic provinces or realms through Cretaceous time that incorporates the work of Zaklinskaya (1977). Both authors discussed the Aquilapollenites (or Triprojectacites) Province and the Normapolles Province. Late Cretaceous marine transgressions separated these provinces in North America and western Siberia. The Aquilapollenites Province extended from the eastern part of the West Siberian Plain across central Siberia to the Russian Far East, northern China, and Japan to western North America. The Aquilapollenites Province comprises subprovinces, and districts within those, based on differences in the palynofloras such as the presence or absence of Wodehouseia. For example, Wodehouseia is not present in the Khatanga-Lena Subprovince in northern Siberia and Yakutia, but is present in the Yenisey-Amur Subprovince to the south. In western North America the palynofloras of the Canadian Arctic and Alaska resemble those of the Ust' Yenisey District of the Yenisey-Amur Subprovince, whereas those from more southerly latitudes in North America have elements in common with central Siberia and the Russian Far East (Batten 1984). Figure 5.4 Palynofloristic provinces of the Late Cretaceous (modified from Herngreen et al. 1996). Reprinted by permission. The most recent comprehensive survey of palynofloral provinces of the Cretaceous is that of Herngreen et al. (1996). A map presented by those authors and reproduced here in slightly modified form as Figure 5.4 diagrammatically summarizes the distribution of the Aquilapollenites and Normapolles provinces (see arrows) and other palynofloristic provinces of the Late Cretaceous. The Palmae Province occupied equatorial regions in Late Cretaceous time and the Nothofagidites Province occupied southern South America, Antarctica, New Zealand, and Australia. In northern Africa, floristic mixing of elements of the Palmae Province with those of the Normapolles Province is indicated by the diagonal black lines in Figure 5.4. Similar blurring of palynofloral province boundaries is shown for central Asia and south-central North America. In all of these areas, some palynomorph species typical of adjacent provinces may be found. Another approach to classify Maastrichtian vegetation is the biome approach applied by Horrell (1991). He surveyed 205 megafloral and palynofloral localities worldwide and attempted to assign them to one of ten modern biome types. The modern biome types were based on precipitation, temperature, and the seasonal variability of those two factors. He recognized 12 climatic zones corresponding to seven of the ten modern biomes, but could not find Maastrichtian analogs for the boreal conifer, tundra, or glacial biomes. In the context of this survey, he tracked the occurrence of 11 families of ferns; 4 families of conifers, the Cycadaceae, Ginkgoaceae, Gnetaceae/Ephedraceae; and 22 angiosperm families, and mapped them onto his 7 biomes. At the family level, all groups surveyed by Horrell survived into the Paleocene. The only regions that have a large enough sample of Maastrichtian megaflora and palynoflora to merit regional overviews are the Western Interior of North America and the Russian Far East. In North America, the level of terrestrial stratigraphic resolution is better for the top of the Maastrichtian than its base (because its base largely occurs in marine rocks), and in the Russian Far East both the top and the bottom of the Maastrichtian are poorly constrained. Wolfe and Upchurch (1987b) based their summary of the North American Maastrichtian megafloras on literature dating from the 1860s to the 1940s, although they admitted that much of the family- to species-level taxonomy was in need of revision. For this reason, they concentrated on the leaf and wood physiognomy of the floras and primarily characterized the climate and vegetation type rather than defining the species-level floral composition. Their summary included the megafloras of the McNairy Sand of Tennessee; the lower Atanekerdluk Formation of west Greenland; the Raton and Vermejo formations of the Raton Basin of Colorado and New Mexico; the Laramie and Denver formations of Colorado; the Hell Creek, Lance, and Fox Hills formations of the Powder River and Williston basins of Wyoming, Montana, and the Dakotas; and the Brazeau Formation of Alberta. They concluded that the Maastrichtian floras grew in a subhumid climate that at the end of the Maastrichtian was as warm as the Late Cretaceous thermal maximum of the Santonian. In a subsequent paper, Upchurch and Wolfe (1993) used the historical data to compare the floristic composition of Maastrichtian megafloras from Saskatchewan, Montana, Wyoming, Colorado, New Mexico, and Tennessee. Angiosperms account for 79-95% of the species diversity. Conifers account for 0-10%, and pteridophytes are similarly low at 0-14%. The only cycad recorded in these floras is Nilssonia, and Ginkgo is present in some floras. On a regional to continental scale, the Maastrichtian flora of central North America is clearly dominated by angiosperms. Ginkgo, and 0.3% bryophyte. These data supported the continent-wide pattern observed in the historical data by Upchurch and Wolfe (1993). In terms of taxonomy, the Hell Creek flora has a few rare ferns, one cycad, one ginkgo, and conifers representing the Taxodiaceae, Cupressaceae, and Araucariaceae. The identified angiosperms are dominated by the Lauraceae, Platanaceae, Magnoliaceae, Cercidiphyllaceae, Araceae, and Arecaceae (Palmae). A number of other extant families that are present in the flora include the Berberidaceae, Ranunculaceae, Cannabaceae, Urticaceae, Ulmaceae, Malvaceae, Rosaceae, Rhamnaceae, and Cornaceae. A large proportion of the flora is composed of dicotyledonous angiosperms that have not been identified to subclass. Thus, the overall affinities of the flora still remain in need of systematic study. One interesting characteristic of the late Maastrichtian flora of North Dakota is the high percentage of angiosperms with pinnately or palmately lobed leaves. At some localities, up to 30% of the species have lobed leaves (see Section 6.2). 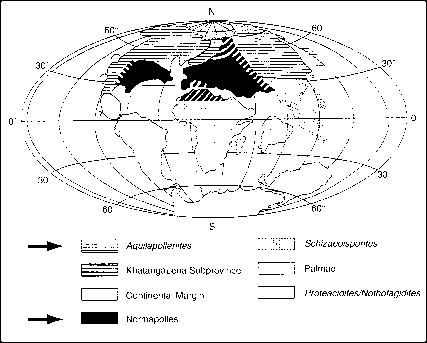 The Maastrichtian megaflora of the Russian Far East has been summarized by Krassilov (2003), who focused on megafloras from the area along the Amur River, the Koryak Uplands, and the west coast of Sakhalin Island (see Section 8.5). The correlation of these Russian sections to the geological time scale in general, and to the Maastrichtian stage specifically, is not yet well constrained by geochronology, magnetostratigraphy, or globally accepted bio-stratigraphy. Nonetheless, these megafloras are associated with palynofloras of the Aquilapollenites Province and they bear a striking resemblance to North American Maastrichtian megafloras. Based on the sample of Late Cretaceous megaflora from North America and from the Russian Far East, two patterns become apparent in the Northern Hemisphere: angiosperms are the overwhelming dominant and are extremely diverse in the Maastrichtian, and conifers are vegetatively more common at higher latitudes. Essentially no Maastrichtian megafloras are known from equatorial regions, but this pattern is beginning to change with the work of Carlos Jaramillo and students in Colombia (e.g., Jaramillo and De la Parra 2006). Southern Hemisphere Maastrichtian megafloras are known primarily from the South Island of New Zealand (Pole 1992, Kennedy et al. 2002), the Antarctic Peninsula (Dutra and Batten 2000), and Patagonia (Yabe et al. 2006). All of these areas were at high paleolatitudes in Maastrichtian time. These floras are modestly well known and are composed of podocarpaceous and araucarian conifers, taeniopterid cycadophytes, pteridophytes, and a variety of angiosperms including Betulaceae, Lauraceae, Sterculiaceae(? ), Proteaceae, and large-leaved forms of Nothofagus. An interesting pattern evident in these floras is the appearance of lobed angiosperms. Lobed angiosperms, associated with the deciduous habit in temperate mesic climates, are effectively absent from the extant, mesic, mixed conifer and broad-leafed evergreen forests of New Zealand and Chile. The presence of lobed leaves in the Maastrichtian floras of New Zealand, Antarctica, and Patagonia suggests that these floras may have been deciduous. In summary, Maastrichtian megafloras are known from mid to high latitudes in both hemispheres, but are essentially unknown at equatorial latitudes. Broad floristic and biomal patterns can be drawn by palynology, but these are limited in their botanical resolution. At a global scale, the transition from the Mesophytic to the Cenophytic was complete by the Maastrichtian and floral change at the K-T boundary occurred in a world where angiosperms represented both floristic and vegetational dominance.